Anna Bozman Thompson lost her son, Lake, in May to leukemia. He was just three weeks shy of his 9th birthday, according to the Prayers for Lake Bozman Facebook page. Thompson recently married her longtime boyfriend, Travis Thompson, in Colbert, Georgia. The couple had put their wedding on hold for years to focus on Lake’s health, Fox News reported, although their wedding was something Lake had always wanted. Despite plans for the beautiful outdoor wedding, Thompson was not looking forward to the family photo portion of the big day — taking pictures without Lake would be understandably difficult for the grieving mother. 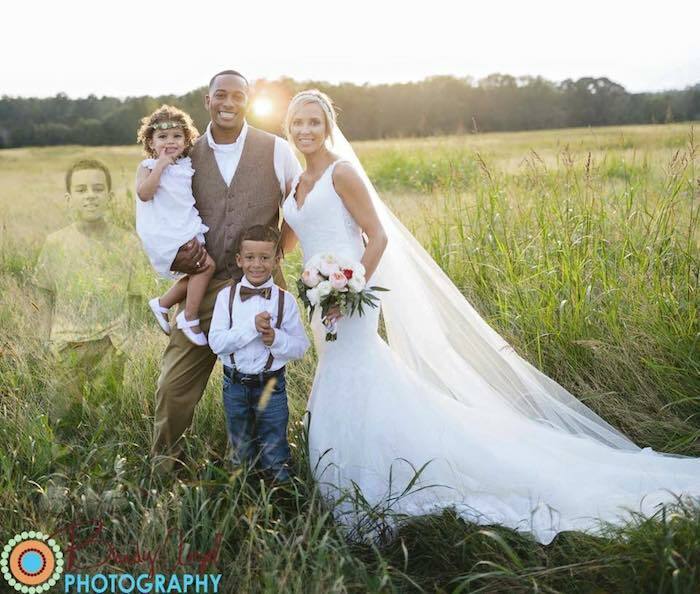 But Thompson’s friend, photographer Brandy Angel, not only photographed the wedding, but made sure Lake would have a way of being there. Angel worked with a man named Paul Woodward to photoshop Lake into the family portrait. Now, when Thompson looks back at her big day, she’ll be able to see, and feel, Lake’s presence.